Police have confirmed the man shot dead by police hunting those behind last Thursday's attempted London bombings was not connected with the attacks. The family of Brazilian Jean Charles de Menezes, 27, are demanding answers to why he was killed by officers at Stockwell Tube station, while police say they cannot rule out further deaths in the hunt for the bombers. The BBC News website looks at the implications of the shooting and how it will be investigated. Q: Why was an innocent man shot by armed police officers? This is already a contentious point because the family of Jean Charles de Menezes believe he would have had no reason to flee police and that he was in the UK legally. They also say he would have been used to seeing police carrying guns because it was routine in his native Brazil. Police said their suspicions were raised because of Mr Menezes clothing and behaviour. An eyewitness had said Mr Menezes was wearing a padded jacket in warm weather, which could have been concealing a bomb belt. Mr Menezes was followed from his flat in Tulse Hill to Stockwell Tube station. Police said Mr Menezes was challenged but did not stop. Police say they had no option but to shoot him in the head because if he had had a bomb, it could still have been detonated while he lay on the floor. On Monday, officials said electrician Mr Menezes had come to the UK on a student visa, which allows people to work for a small number of hours, but it had expired. BBC correspondents say this could explain why he ran from police. However, Mr Menezes' family have denied his visa had run out. Q: Who will investigate the death? The investigation has been referred to the Independent Police Complaints Commission (IPCC), as are all fatal police shootings. The commission assigns its own investigators to the case to ensure its impartiality. No time frame has been set for the investigation but the IPCC is expected to make a statement on Monday. An inquest into the death of Mr Menezes will also be held. Although a coroner is in charge of proceedings, in the circumstances a jury could be asked to decide whether the death was lawful. The Crown Prosecution Service could bring charges against the officers if it is considered that the force used was unreasonable. Will the shooting lead to a change in the "shoot-to-kill" policy? Metropolitan Police Commissioner Sir Ian Blair insisted there would be no change in policy following the "tragedy" of Mr Menezes' death. Chief constable Ken Jones, chairman of the Association of Chief Police Officers' terrorism committee, said officers only killed as a last resort. He said: "Everything else must be tried first before we consider taking life to save life." Former foreign secretary Robin Cook has called for a review of the policy in the wake of the shooting. He said he thought there should be "a tightening of the guidelines and the rules of engagement to make sure it doesn't happen again". Q: What impact will the shooting have on the way the police investigate the bombings? This is going to be very, very difficult for the police, but the threat of suicide bombing means these are very different times to those they have faced in the past. The police have been looking at tactics to deal with this kind of situation for a few years now, but those tactics are going to be under even more intense scrutiny. It is a sign of this whole new environment that the police, the security services, and the general public are now operating in and the new tensions that will create. Q: Will this have an effect on attempts to foster good community relations? The issue of community relations lies at the heart of this situation. Since the 7 July bombings there has been a lot of emphasis by the police on the need to maintain community relations as some of the best intelligence comes from the public, and because of fears of rising tension. 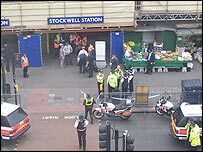 There had been some concerns from minority communities - especially Muslims - about the incident at Stockwell, even before we knew Mr Menezes was not connected to the inquiry . Met Police Commissioner Sir Ian Blair is to meet with community leaders to discuss the fight against terrorism. The Stop the War Coalition, which rallied against the UK's involvement with the Iraq war, has organised a vigil outside Stockwell station at 1800 BST on Monday. Organiser John Rees said: "However horrific the bombings in London on 7 July and however important it is to secure the safety of the public, there can be no excuse for the police adopting a shoot-to-kill policy which guns down innocent people in cold blood." Q: Does the shooting represent a setback for Prime Minister Tony Blair? Tony Blair is content to let the police launch its own investigation to see exactly went wrong in this case. Number 10 has also reiterated its support of the security services and the police in this difficult situation of trying to trace the bombers still at large. But this is the last thing the prime minister needs at the moment. He is going out of his way to stress the importance of close community relations and get the police working to try to bring everybody together at a time when the attackers appear to want to try to divide society. The last thing he needs politically is for an innocent man to be shot, and to be shot so publicly in front of so many horrified witnesses.